Parents pick up their children after school at Weston Elementary in Ripon, CA, on Thursday, March 14, 2019. Ripon Unified School District is working with Sprint to move a cellular phone tower, seen in the center background, after four students were diagnosed with cancer and parents voiced their concerns. 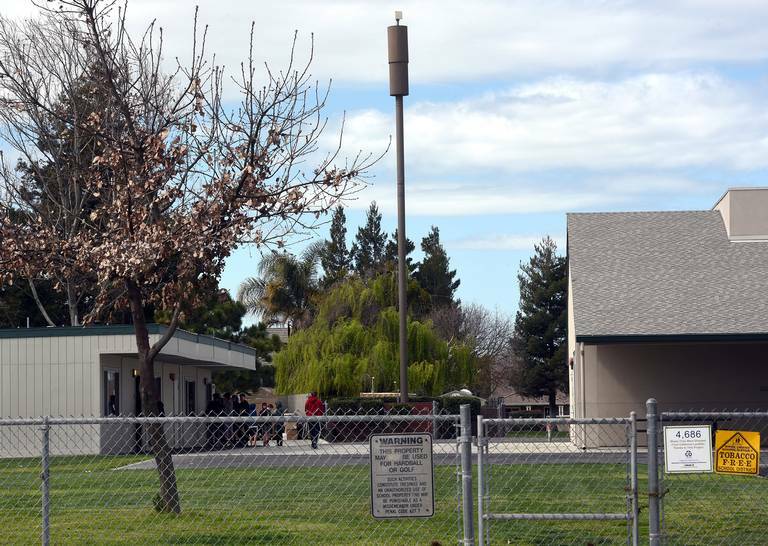 Even with apparent movement to relocate a cell phone tower at a Ripon school, a public debate over the potentially harmful effects of wireless service radiation might just be beginning in cities in the Northern San Joaquin Valley. A spokeswoman for Sprint said Friday a company representative was in Ripon earlier this week, talking to the school district and considering where to move the Weston Elementary School tower that’s created an uproar. “We are definitely moving forward on that,” Sprint Spokeswoman Adrienne Norton said. She didn’t have a time estimate on relocating the cell site. “We work with a lot of different communities on concerns they might have,” Norton said. Parents whose children attend Weston School suspect the cell phone tower on campus is related to seven cancer cases among students and teachers. The cases include four students diagnosed with different forms of cancer in the last three years and three teachers. This entry was posted on March 25, 2019, 3:16 am and is filed under 4G, antenna, antenna removal, Brain Tumour, California, cancer, cancer cluster, cell tower, Children, leukemia, Ripon, school, Sprint, United States. You can follow any responses to this entry through RSS 2.0. You can leave a response, or trackback from your own site.